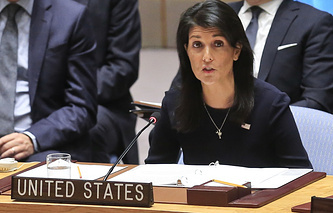 In her speech, Haley argued that dictators violate human rights and incite violence, and provoke regional conflicts, under the guise of the sovereignty principle. She cited the behavior of leaders of Iran, North Korea and Syria as an example, and mentioned Moscow's policy. "In Ukraine, Russia remains an occupying force in Crimea and a destabilizing force in Eastern Ukraine. Let me repeat: the sovereign rights of nations are fundamental. But when we don’t uphold the principle of sovereignty by allowing the Kim, Assad, and Putin regimes to act with impunity, just the opposite is true. When the Security Council provides accountability for nations that violate the UN Charter, we protect sovereignty. Such was the case in 1990 when Saddam Hussein invaded Kuwait," Haley said. "I would like to remind Ambassador Haley that Russia does not have a regime, but a legally elected president and appointed government," Nebenzya said. "I would like to ask the American delegation in the future to adhere to at least basic diplomatic decency. By the way, Syria, too, has a legitimate government, whether someone likes it or not," he added. According to Nebenzya, for some states "it is difficult to accept the obvious thing." "The era of the Cold War, as well as the post-bipolar stage, have ended. The world is establishing a new, more just, democratic, polycentric world order. Its essence is in the emergence and strengthening of new centers of economic power and political influence," he added. He called the topic of the meeting very relevant for the current state of international relations, noting that the principles of independence and equality of states, as well as non-interference in their internal affairs and peaceful settlement of disputes "represent the basis of good-neighborly relations" between countries and mutually beneficial cooperation "for the common good." "Unfortunately, throughout the history of the United Nations, the world has witnessed numerous examples of blatant disregard for the UN Charter up to the illegal use of force, undisguised interference in the affairs of states, destruction of traditional social principles, forcible change of power and imposition of alien cultural and social norms," Nebenzya said. He cited the bombing of Yugoslavia and Libya, carried out in violation of international law and Security Council resolutions, as well as "the occupation of Iraq under false pretenses". The diplomat reiterated Russia's commitment to an early settlement to the conflict in Ukraine, warning that "as long as Kiev sabotages the Minsk process" and "sells its legend to the world" about what is happening in the country, there is "little hope for a constructive development of events." The meeting on Wednesday was held upon an initiative of Kuwait taking the UN Security Council’s monthly presidency in February.